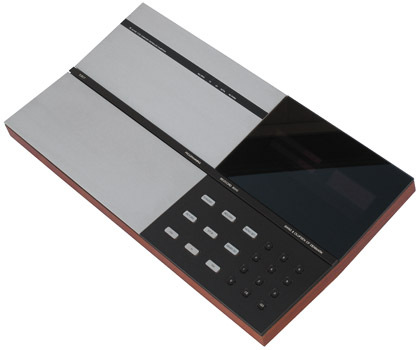 The Beocord 9000 was initially offered alongside the Beocord 8002 and 6000 as an alternative offering even higher performance for the serious cassette user. Visually very similar to both these models, it could be identified visually by an extra black band (housing the indicator lamps for tape type and “record open”) across the aluminium lid. It could also be observed that half the keys were black and half silver, so that the Beocord 9000 could match both the Beomaster 8000 (silver keys) and the Beomaster 6000 (black keys). This could not be regarded as a complete styling success, as it meant that of course it matched neither model properly! The Beocord 9000 offered a number of extra features over the 8002 and 6000, and despite looking similar both inside and out, the 9000 was massively more complicated and very few parts were interchangeable. Principle amongst these features was the CCC (computer controlled calibration) system, which optimised bias, equalisation, sensitivity and VU meter calibration for any cassette automatically. To be able to do this in a reasonable amount of time, 3 heads were fitted, the record and replay heads being mounted in a common housing (unlike the earlier 3 head version of the Beocord 5000). The computer controlled a built in signal generator and attenuator system which recorded a short toneburst on the tape, measured the results and set itself accordingly to make quality recordings. A maximum bandwidth of 22KHz was claimed, the best ever for a cassette Beocord. The winding of the tape, recording and playback that was required for the calibration process took place automatically, and could be combined with the measurements for the real-time tape counter (like that fitted to the rest of the models in this series) if desired. As the playback channel was used in the CCC process, it was required to be particularly accurate. Complex adjustments were required to match the electronics to the head, and the value of one particular capacitor had to be decided upon by measurement. The CCC system could even use Ferrichrome tape, something that no other Beocord was optimised to do. Ferrichome was unusual in Europe, so a Sony tape was recommended for this position. Text copyright © Beocentral. Unauthorised reproduction prohibited. Despite the automation of the recording process that CCC was capable of, the adjustment of the recording level was still manual only, with no option of automatic level control. The two sliders were placed under the cassette lid and were identical to those fitted to the other models in the series. Text copyright © Beocentral. Unauthorised reproduction prohibited. Another new and unique feature was the Dolby C type noise reduction. This technique was capable of 20dB of noise reduction, as opposed to 10dB with Dolby B. The noise reduction circuit was very complex and used 12 integrated circuits. There were also changes made to the input amplifier, which offered a sensitivity switch (DIN/line) like the 8002, but it was the gain of the amplifier, rather than just its input matching, that was altered in the 9000 version, a far more satisfactory arrangement. The stereo microphone amplifier was left mostly unchanged, but the DIN socket on the front of the machine was supplemented by a ¼" jack socket, though it is not clear exactly why. Text copyright © Beocentral. Unauthorised reproduction prohibited. Mechanically there were few alterations to the excellent Japanese cassette transport that was fitted to all these models (and the Beocenter 7000 range). The differences were that of course 3 heads were fitted and that an extra reel sensor was added, monitoring the supply spool. This had two functions: Firstly, it allowed a “tape end” mode to be added to the real-time counter. During recording, once the tape was within 10 minutes of its end, the time display would alternate between “time used” and “time remaining (and remain on “time remaining” for the last minute or so). This system of course required further calibration when the tape was inserted, and this could only be done in “record open” mode. The second function of the additional reel sensor was to allow the spools to be slowed down during winding as the end of the tape became near. A special two-speed motor was needed to do this, and while the system was undoubtedly more gentle with cassettes that the other models that used this deck, there was never really a problem with these snapping tapes anyway! Uniquely, the Beocord 9000 user was encouraged to adjust the head azimuth of the machine to match whatever tapes were being played. A hole by the cassette tray allowed access to the screw, which had a finer thread than was usual to aid accurate setting. A non-magnetic screwdriver was provided to make the adjustment (the same type that was included with pickups for tightening the fixing screws), as was an alignment tape, recorded on a top quality TDK MA-R cassette, so that the settings could be returned to their original position. Early versions of the alignment tape had a single 12.5KHz tone recorded on them, later ones had “white noise”, as this was found easier to use. Text copyright © Beocentral. Unauthorised reproduction prohibited. The Beocord 9000 provided the highest possible quality for those demanding it. It was very expensive (a popular British magazine stated that it was the most expensive single capstan domestic cassette deck on the market) and complicated, but remained available until 1986 when the Beomaster 6000 and Beocord 8004 were withdrawn. It changed only when the Dolby C equipped Beocord 8004 was introduced, when the 9000 was fitted with a new (and far simpler) Dolby circuit comprised of just two specialised integrated circuits from Hitachi. The same printed panel was fitted to the 8004 and the same circuit was used in the new Beocord 5000. Text copyright © Beocentral. Unauthorised reproduction prohibited. While the Beocord 9000 was a technical triumph and a highpoint in cassette deck engineering, it did not have any real influence in the design of future Beocords. CCC and the real time counter were quietly dropped when it was deleted from the range, and Dolby C never really caught on either. The standardisation of cassette tapes by the IEC made CCC largely redundant, and as a top quality “no compromise” machine, Beocord 9000 was not replaced by another model. Text copyright © Beocentral. Unauthorised reproduction prohibited.